Many mechanism think the ratchet handle is the heart of the tool kit. So other accessories can be viewed as hands or feet. The accessories play the very important role for the professional mechanisms. Different work environment need different accessories. Extension bar is design to prolong the socket so the end user can easily access the deep bottom nut or bolt. 1/4"DR., 3/8"DR. and 1/2"DR. are the common sizes in the market. The purpose of adaptor is to change the driver from small size to the large size or vice versa. For example, if you only have one 3/8" ratchet handle and you need to use 1/2"DR. Socket. The 3/8" to 1/2" Adaptor will be your good friend. 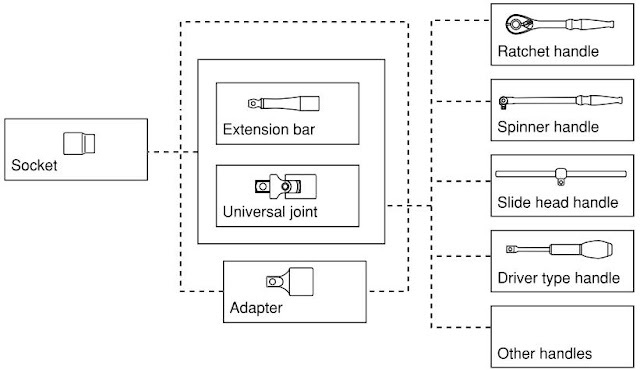 The universal joint can let user to reach the bolt or nut in some very confined space, especially some bending angle. The flexible handle can be seen as the similar tool as ratchet handle. The key difference is that the flexible handle is longer and can easily apply high torque on the target. Both tool are designed for the same purpose: to quickly get the job done in the open space. Both tool can be attached the socket and drive it without too much wasting energy and changing position. Tien-I manufacturer and produce all the different kind of accessories for socket set, if you have need any further information, contact Tien-I sales Team.